Voting for John McCain is a referendum on the liberal media. They have made it obvious that they support Barack Obama and will cover for him by not covering him when that’s in his (and hence their) best interests. They are doing what they can to get Obama elected a few weeks from now. This is patronizing and offensive. They presume to know better than voting Americans who should be the leader of this great nation. They filter the news and editorialize without restraint, believing that we must rely on them to get the facts that matter. Since we do rely on them for this, and they have not fulfilled their noble duty, voters can send a powerful message of disapproval to the media by voting for the McCain/Palin ticket. If they do, they will also have a President they actually know something about. He was someone I thought it would be great to meet sometime. Had I known he was living and working only a stone’s throw away, it might have been arranged. Unfortunately, that won’t be possible. David Foster Wallace hanged himself and was found by his wife when she returned home Friday night, September 12, 2008. He was 46. Wallace was clever with words. He was inventive. He employed extensive footnotes in his fiction. And he was candid. He went naked onto the page and exposed his soul in ways few novelists do. His parents were university professors, his father in the department of philosophy at the University of Illinois (Urbana-Champaign). David Foster Wallace himself majored in English and philosophy at Amherst College. And it shows in his writings. His writings reveal something else, too. In his tribute to Wallace, David Gates writes that “we’ll surely be spotting more and more of these clues in his work,” clues of his long-standing depression and contemplation of suicide. I find it hard to believe that Wallace’s readers didn’t suspect it already, because the clues are littered everywhere. While reading Wallace myself, I would recall the thesis that genius and great art are often accompanied by threatened madness, that great talent and erudition can only be managed with a colossal effort of self-possession that no one else but the artist can know. In her book, The Midnight Disease, neurologist Alice Flaherty examines the mental disorders that frequently haunt the most creative writers. She develops an illuminating theory of “manic hypergraphia.” Kay Redfield Jamison, whose work I’ve recommended on this blog, explores the culverts of this condition in a wonderful book called Touched with Fire: Manic Depressive Illness and the Artistic Temperament. The treasure of a gifted man’s labor is more precious when understood in the light of this fire. McCain’s Promise: Aboard the Straight Talk Express with John McCain and a Whole Bunch of Actual Reporters, Thinking about Hope. OK, this is funny! Thanks, TPM. I used to wonder why the United States didn’t work vigorously to free itself from dependence on “foreign oil.” It seemed like a good idea to me “back then”—during Jimmy Carter’s presidency. Popular opinion was that there wasn’t much oil to be found outside the OPEC region. After all, “OPEC” is the acronym for “the Organization of the Petroleum Exporting Countries.” And who were the petroleum exporting countries? The original five members of OPEC were Iran, Iraq, Kuwait, Saudia Arabia, and . . . Venezuela. Do you see a pattern here? Four of these countries were and are dominant Middle East players. Venezuela, it should be recalled, is the heavy in South America, led today by Hugo Chavez—no friend to the United States. And Venezuela took the initiative originally to establish OPEC, by approaching the just-mentioned nations of the Middle East. There are now thirteen member states in OPEC. Guess who’s not on the list? The United States. And why not? Because the United States does not export oil. On the contrary, for decades, the United States has been the chief importer of oil. Why doesn’t the United States export oil? Because it doesn’t have enough oil to export. It doesn’t even have enough oil to meet its own demand. That makes us dependent on foreign oil. And that’s reason enough for us to be entangled in Middle Eastern politics and subject to the whims of blame-America-first terrorists born and bred in the Middle East. At the outset of the war in Iraq, there was loud speculation that President Bush was making a grab for Iraqi oil. This speculation was interlarded with denouncements of the merit of such a motive. And where do we find ourselves today? Gas at the pump where I live in southern California is very near the $5 mark, and the price of oil has just topped $140 a barrel, a new high. Market watchers are hyper-ventilating this afternoon. At CNBC, Maria Bartiromo is high on adrenalin as she reports the news. What’s wrong with this picture? The United States has waited too long to tap its own oil resources. Do we have oil? Yes. And, no. We don’t have much oil for use, much less for export. But there’s oil out there, on the continental shelf and in ANWR. And it’s been there throughout our dependence on oil. And there’s lots of it. Enough there for us to tell OPEC we don’t need them anymore. Imagine what it would mean geopolitically if we ended our dependence on oil in the Middle East. Setting aside the legitimate interest we have in protecting Israel, we might be able to sustain a responsible form of “protectionism.” As long as our economy runs on oil, we’ll continue to be enmeshed in worldwide conflicts that are fueled by oil dependence. What are the primary objections to drilling the oil resources we have? First, we’re being told that “we can’t drill our way out of the current crisis.” One element in this rhetoric is right: we are in crisis. The crisis goes deeper than the prospect of paying $5 and more per gallon of gasoline. But that prospect is the sort of crisis that has Americans paying more than the usual degree of attention to political maneuvering in Congress and among the presumptive nominees for President, Barack Obama and John McCain. Obama is the most visible opponent of drilling. He talks about developing alternative forms of energy. But that won’t address the crisis, either. Why? Because the crisis is at the pump. 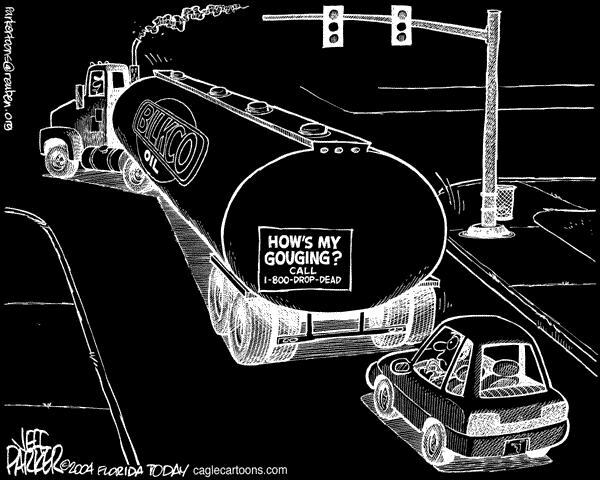 And most of us are stuck with pumping gas for the foreseeable future. It will take a few years to begin extracting crude oil from the ground. Will it take longer than the development of alternative energy forms? Almost certainly not. Any major delays to drilling going forward will be due to obstructionist politics, mostly on the part of Democrats, and chiefly on the part of Barack Obama, if elected President. Obama could not now reverse his view about the wisdom of drilling without appearing to be the worst kind of flip-flopper. So he’s backed himself into a corner. What’s in the economic interests of the country is at odds with Obama’s interest in becoming President. Whose interests will command his attention? You know the answer. So ask yourself if that’s the sort of person you want to have as President. What most Americans want is short-term relief at the pump and a long-term solution to our energy crisis. If the establishment of a drilling infrastructure—directed at the most promising locations off-shore and in ANWR—were to begin in earnest by the end of this year or early next year, we wouldn’t have to wait for the oil to make it to the corner gas station for prices to come down. The prospect of such a radical change in supply and demand within three to five years would place immediate pressure on current suppliers (i.e., OPEC) to do something about prices. John McCain has started making this point, and he’s right. How does Obama respond to that? If Americans elect John McCain, who favors drilling, OPEC will get the message before the end of the year. We’re only about four months away from sending that message. Second, there’s the green-jerk reaction to drilling. “Drilling offshore and in ANWR is going to be environmentally catastrophic.” Show me the evidence. Opponents of offshore drilling exploit vernacular associations with the word “offshore,” as if America’s beaches will be cluttered with unsightly oil rigs. What’s the truth? Deep-water oil and gas platforms will be so far offshore that they couldn’t be seen from our beaches. We’re talking fifty to two hundred miles offshore. I could kayak the entire California shoreline and not be able to plot a single oil drilling site offshore. 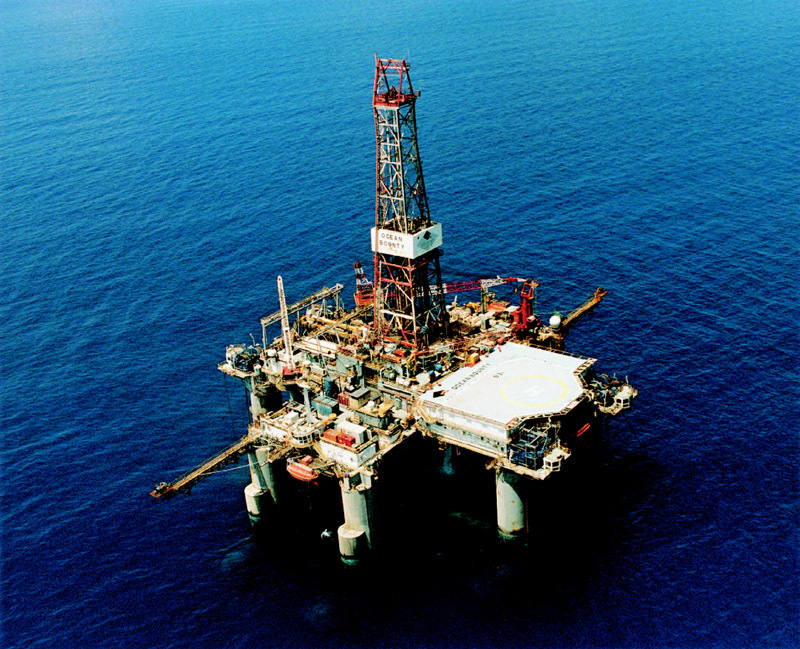 It would take an hour or longer to travel by helicopter to a typical offshore platform. ANWR is another acronym (pronounced “Anwar”), short for “Arctic National Wildlife Refuge.” It’s located in the extreme northeastern region of Alaska and encompasses some 19 million acres. It includes what is literally the most remote territory in the United States. A portion of the region contains rich sources of petroleum. In contention is the effect drilling there would have on the habitat of diverse forms of animal life. ANWR is remarkable for its inclusion of six distinct biozones. 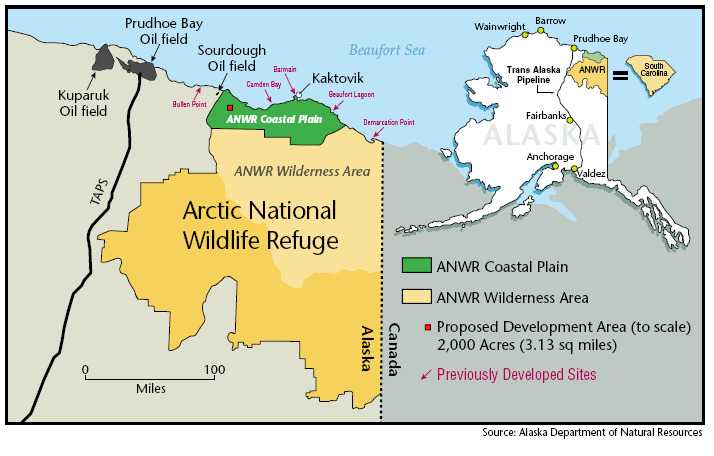 But the petroleum rich subsection of ANWR is part of a 1.5 million acre extension of the refuge made in 1980. The move appears to have been as much an effort to protect this resource for possible future drilling as it was for any other environmental objective. A very small percent, then, of ANWR is even considered attractive for oil-production purposes. And yet the resource is thought to be incredibly rich. And though approval by Congress is required to begin drilling in that area, it has, from the beginning, been regarded a potential source of oil production to be used under the right conditions. Americans need to be educated about the potential for oil production in ANWR, the politics surrounding the possible use of this resource, and alternatives to drilling in ANWR. For the time-being, offshore drilling appears to be more imminent than drilling in ANWR. This is in part due to political vicissitudes. But off-shore production may also be more cost-effective. In any case, ANWR need not be the bone of contention that it has been, with such impressive resources closer to hand, both geographically and politically. The emerging market demand for oil worldwide could position the United States to be a major exporter of oil. This demand will be so substantial by 2030 that prices for a barrel of oil could inflate to unimaginable levels. But by then, the United States could be online as a major oil producing country. Meanwhile, by all means, we should be heavily invested in research and development for alternative forms of energy. And Americans should become better informed about the affordability, safety, and cleanliness of nuclear energy. Barack Obama is disappointed in John McCain. In the ensuing months, he may have to get used to disappointment. Especially if he’s going to use his media opportunities to demand apologies from McCain for things he hasn’t done. First time at bat in this game, Senator Obama is disappointed that Senator McCain has not denounced the rumor and innuendo that Mrs. Obama (do we still call our First Ladies “Mrs.”?) used the racist word “whitey” in a speech some years ago. But rumor has it that it was someone close to Hillary Clinton who threw the first pitch, presumably in an effort to discredit Senator Obama during the Democrat primaries. So what has Senator McCain done wrong in this inning? His sin is one of omission rather than commission: he hasn’t had the decency to denounce the scurrilous rumor. Must McCain now monitor every negative thing that’s said about the Obamas and use his own media opportunities to distance himself from the source of each rumor? Come on—this is the Big Leagues. Champions don’t play ball in the sandbox. First, McCain’s credentials as a man of fairness do not depend on what other people say about his political opponents, unless those other people speak in some suitably official sense on his behalf. A President’s spouse is, presumably, an intimate life-partner and a reflection on the President’s values and wisdom when making substantive decisions. Presidential wives have exercised considerable independent leadership on issues of national interest, exploiting (rightly or wrongly) the opportunity created by virtue of nuptial relations with the President. A President’s spouse is a key ambassador to the world and a barometer of what is best about America. American citizens have a vested interest in how their First Lady represents them. That last point leads to a third reason why McCain should not swing at Obama’s pitch. It’s likely that a non-trivial number of Americans would like to know whether Michelle Obama actually spoke (or mis-spoke) as alleged. And public opinion has to be respected by candidates for high office. The influential role of public opinion isn’t some necessary evil made inevitable by democracy. The influence of public opinion is a public good, especially when it is well-informed opinion. It is one of the few means available for the electorate to hold its leaders (or would-be leaders) accountable. Some political leaders have been remarkably obtuse about this. Ours is an open society in ways unimaginable just decades ago. Still, an astonishing number of politicians today behave in an impolitic manner, as if no one will notice. Barack Obama’s decision to bait John McCain may prove to be a strategic error, for it’s likely to encourage the electorate to make more deliberate comparisons between Michelle Obama and Cindy McCain. Who can be predict what that will mean? The two woman are conspicuously different in many respects. Polling the electorate on this point probably won’t be very illuminating, since many people would consider questions about potential First Ladies to be indelicate, even if their Presidential preference is influenced by impressions they have of candidates’ wives. And Obama’s recent comments suggest that he prefers to re-direct focus on his wife.